Use games and exercises to increase laughter and play, while decreasing tantrums and fights. Teach your brain new skills so you don’t get upset so often and can calm down faster. Practice discipline strategies that teach kids self-management and emotional intelligence. Strengthen your bond with your child so they want to cooperate. Discover simple mindfulness and meditation exercises to find peace in a busy home. Dr. Laura Markham is the author of the book Peaceful Parent, Happy Kids: How to Stop Yelling and Start Connecting, which continues to rack up 5 star reviews on Amazon, attesting to the power of her relationship-based approach to parenting. Dr. Laura trained as a Clinical Psychologist, earning her PhD from Columbia University. But she's also a mom, so she translates proven science into the practical solutions you need for the family life you want. The founding editor of the extensive website AhaParenting.com, Dr. Laura sends a free coaching email three times weekly to over 100,000 parents and contributes to many websites, including Psychology Today, Mothering.com, The Natural Parent Magazine, Pregnancy.org, Girlie Girl Army, and SheKnows.com. She makes frequent TV and radio appearances and has been interviewed for hundreds of articles by publications as diverse as The Wall Street Journal, Real Simple, Newsday, Men's Health, Redbook and Parents Magazine. She is also the author of Peaceful Parent, Happy Siblings: How to Stop the Fighting and Raise Friends for Life. Dr. Laura's relationship-based parenting model has helped thousands of families across the U.S. and Canada find compassionate, common-sense solutions to everything from separation anxiety and sleep problems to sass talk and cell phones. She lives in Brooklyn, New York, with her husband and has two terrific kids. "Dr. Laura Markham's book is an extremely useful guide for parents in connecting with their children's emotions. It is highly gratifying to finally see a research-based guide for parents. Every parent will want a copy of this book." "The Peaceful Parent, Happy Kids Workbook teaches parents to manage their own emtions, connect more deeply with their children, and guide kids with respectful, attuned limit-setting. As always, Laura Markham's encouraging tone, realistic scenarios, and step-by-step instructions make her research-based advice immediately accessible to busy parents, brilliantly coaching them to create the strong, healthy child-parent relationship that every mother and father seeks." "The Peaceful Parent, Happy Kids Workbook is more than an excellent resource; it offers a well-researched, clearly written, step-by-step process that will completely transform your parenting. In a carefully guided format, richly packed from first page to last, Dr. Laura Markham teaches the practical and powerful tools that help you skillfully regulate the emotional climate in your family. This is the must-read road map you've been looking for." "Dr. Laura Markham teaches parents how to use the daily challenges of living with children as an opportunity for their own growth. The result is more mindful, peaceful parents, who can help their children grow into happy, responsible people. Clear, compelling and essential for every parent." "Dr. Laura Markham's Peaceful Parent, Happy Kids Workbook is full of enlightening exrcises and worksheets for parents to practice how to regulate their own emotions, and build a lifelong foundation to connect and engage with their children. Mindfulness exercises bring evidence-based and user-friendly ways to integrate mindful awareness into parenting, increasing resiliency for both parent and child." "I will return to Dr. Laura Markham's Peaceful Parent, Happy Kids Workbook again and again. I will return to it for inspiration, guidance, and practical how-to personal reflection. Most importantly, I will revisit her words out of love for my son. For I want him to benefit from the most honest, warm hearted, and peaceful energy I can bring to mothering. When friends, family, or colleagues ask me about my parenting philosophy, I always direct them to the work of Dr. Laura Markham." "Dr. Laura Markham taps into fascinating brain science, meditation and mindfulness practices to help parents heal themselves and be more peaceful. 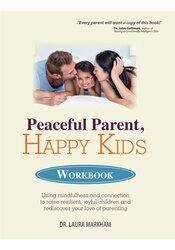 With the exercises, practices and reflections in this book, Peaceful Parent, Happy Kids Workbook provides wonderful support to parents. Dr. Markham inspires parents to believe that they can grow into the best version of themselves." "I am so grateful Dr. Laura Markham has written this workbook. I believe most parents find it difficult to remember helpful guidelines and put them into practice in everyday life when we are angry or impatient with our children. This workbook walks parents through a progression of worksheets and exercises that help incorporate Dr. Markham's ideas about connection into everyday life in practical, hands-on ways. This workbook will change your relationship with your child for the better; will help you engage with your child from a place of love and mindfulness every day." "Laura Markham integrates mindfulness practices and spiritual wisdom with the latest research findings to give parents a toolbox for transformation. Her love for parents and children shines through this book." "The Peaceful Parent, Happy Kids Workbook is like a Swiss Army Knife for parents, with scripts, activities, worksheets and practical tips that parents will find effective, inspiring and fun. Dr. Laura Markham's tone is empowering, and her positive parenting approach works. Every parent will benefit from this book, and the real winners will be their children. "Laura Markham's approach is down-to-earth, filled with respect and compassion for children and parents, and most of all, it's effective. Many parents who have benefited from Laura's writings have told me that they wish they could have her move in with them for awhile and provide on-the-spot advice. This workbook is the next best thing! You will rekindle that spark of connection and joy with your children." "Dr. Markham's book is like a friend, ready to offer support and encouragement when you need it the most. She clearly demonstrates how to replace power struggles with cooperation and a sense of calm. Based on the latest brain and mindfulness research, The Peaceful Parent, Happy Kids Workbook is filled with hope and detailed exercises for understanding and managing your own emotions as well as those of your children. You will discover the secrets to staying emotionally connected and working together, even during the most difficult times." "The root of violence is pain -- When someone can't deal with their pain, they act it out on others. If all parents read the Peaceful Parent, Happy Kids Workbook, our world would have a lot fewer kids who are hurting, and a lot less violence. This book will help any parent raise emotionally intelligent, empathic and kind children who care about others and have the skills to work through conflict in a healthy way. Highly recommended!"